Within the first scenes of Winter’s Bone, director Debra Granik establishes an unforgiving world from which the viewer never escapes. The spare scenery, pale with overcast skies, offers little comfort despite the surrounding nature. Periodic homes connected only by jagged dirt roads have yards filled with broken down cars, metal scraps, and garbage. If the audience didn’t know better, the land might be considered post-apocalyptic. Such homes are interspersed throughout the region, populated by rough backwoods kinfolk whose connection may be through blood, but they share little sympathy for one another. This is where the film’s protagonist, the 17-year-old Ree Dolly, raises her little brother and sister alone, as Ree’s mother will probably never wake from her mental catatonia and her father was jailed for cooking methamphetamines. Ree’s world exists in Missouri’s vacant Ozark territory, where neighbors will offer some leftover venison to Ree’s struggling family, but they turn their heads when it truly matters. Ree’s father has disappeared after his release from jail, and because he put up the Dolly house as collateral for his bond, if he doesn’t report to his court date then Ree will lose the house that’s barely preserving her broken family. Newcomer Jennifer Lawrence plays Ree in a tour-de-force performance that you’ll be hearing about until awards season. It’s even more impressive that she’s relatively inexperienced yet shows a brutal authenticity in her role. Lawrence plays Ree without a concern for herself. Despite her brutal surroundings, she remains confident and smart and knows well enough to stay away from the homemade drugs exchanging hands on the surrounding hills. When the sheriff (Garret Dillahunt) explains that her father, Jessup, must be found or they’ll lose their home, Ree replies without hesitation. “I’ll find him.” She says it in such a way that we believe her. We also believe Ree has never had a childhood, and that she has long since lost her innocence for the necessity to survive no matter the cost. Walking up and down forest trails, Ree visits her distant family members who treat her like an intruder on their land. They know she’s come to ask questions about Jessup, and so for them, she’s as bad as the law. Only her uncle, Teardrop (John Hawkes), shows any compassion for the girl; but it takes much to shake the aggressive man out of his apathy. After all, it’s easier to not get involved than it is to risk bringing attention to oneself. Meanwhile, Ree’s little brother and sister have to grow up fast; she teaches them to hunt small game and clean their kills. She does her best to somehow preserve their childhood innocence. For herself, all Ree wants is to escape to the army, where the forty thousand dollar signing bonus and her hardened disposition would do her well, except, as a minor, her parents aren’t around to sign her over. Granik and Anne Rosellini based their script on the novel by Daniel Woodrell, and they approach the material with rare respect for their subjects. These are characters with rough, leathery faces empty of compassion, but they’re not cartoonish yokel figures depicted with mocking disrespect. Granik involves us in their world with a sense of dreadful discovery, not unlike Francis Ford Coppola does with the Corleones in The Godfather. Both films manage ruthless clans with strict hierarchies, and often merciless rules which everyone must follow. And when someone steps out of line, expect a beating, if not death. Still, there’s a sense of honor about the characters in Winter’s Bone. You don’t cross anyone and you don’t get crossed. You don’t make noise and noise don’t get made. You get the idea. As with the landscape, the production is stripped of all excesses. Consider the music, which is largely based on that of the region. While the quiet score seems to guide the viewer through the burgeoning mystery, native Ozark musician Meredith Cisco sings folk songs in one musical roundup scene that captures the stark emotions always just under the surface. 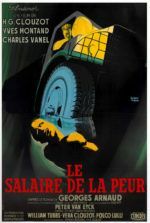 These are emotions that are not so much expressed in the film as they are sensed by the audience, as these characters simply don’t talk about their feelings. Much goes unsaid, so the viewer must be intuitive, reading faces and body language to grasp the depths of characters. 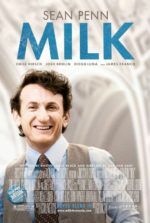 Granik’s film won the Grand Jury Prize and the best screenplay award at the 2010 Sundance Film Festival. It’s easy to see why. 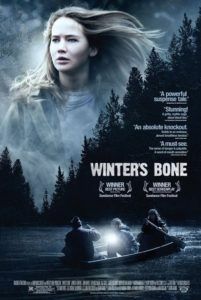 Winter’s Bone has a quiet way of involving the viewer, moving perhaps a little slowly at first, and taking its time to reach Ree’s search for her father. Dialogue is sparse and meaningful. The blue-gray presentation gives a frigid impression of the environment. Every scene feels carefully selected, building upon the devastating heights in the finale. Through it all is the incredible performance by Jennifer Lawrence, whose breakthrough role does not overshadow the story, but accompanies it perfectly. 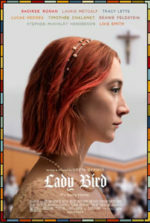 This is an engrossing film, one about the different ways in which people react to impossible situations. And without becoming hackneyed or corny, the story offers a moving solution when it could have so easily fell into a trap of hopelessness.